Used for storing file options. Definition at line 141 of file log-pcap.c. Definition at line 156 of file log-pcap.c. Definition at line 148 of file log-pcap.c. Definition at line 147 of file log-pcap.c. Definition at line 143 of file log-pcap.c. Definition at line 144 of file log-pcap.c. Definition at line 157 of file log-pcap.c. Definition at line 149 of file log-pcap.c. Definition at line 153 of file log-pcap.c. Definition at line 154 of file log-pcap.c. Definition at line 146 of file log-pcap.c. Definition at line 145 of file log-pcap.c. Definition at line 150 of file log-pcap.c. Definition at line 163 of file log-pcap.c. Definition at line 155 of file log-pcap.c. Definition at line 162 of file log-pcap.c. Definition at line 159 of file log-pcap.c. Definition at line 164 of file log-pcap.c. Definition at line 165 of file log-pcap.c. Definition at line 161 of file log-pcap.c. Definition at line 160 of file log-pcap.c. Definition at line 151 of file log-pcap.c. 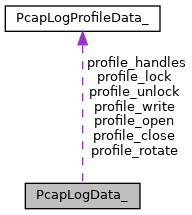 Definition at line 152 of file log-pcap.c. Definition at line 142 of file log-pcap.c.